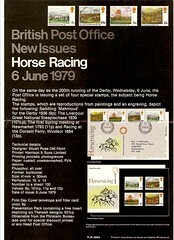 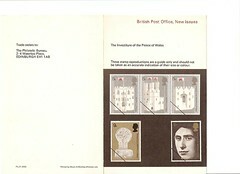 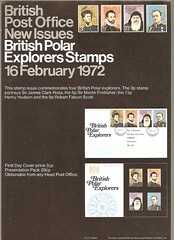 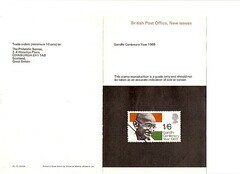 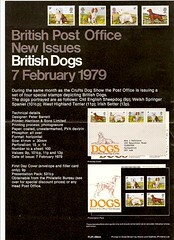 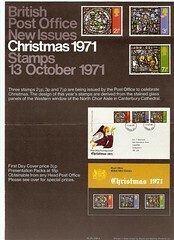 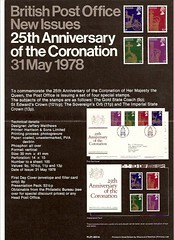 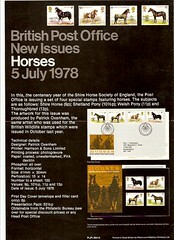 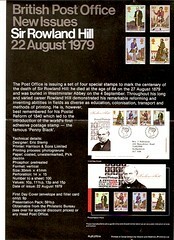 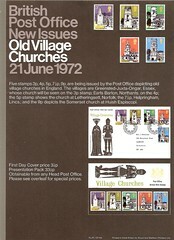 Historically a stamp issue was always announced by the Postmaster General in the House of Commons and Press photographs would be issued once the date of issue had been confirmed. 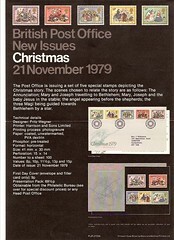 With the increasing demand from collectors for First Day Covers, there was an obvious need for the cover producers to have some idea in advance about the stamp design. 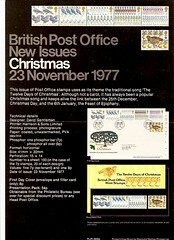 The Post Office was loathe to pre-release stamps to the Press or stamp trade. 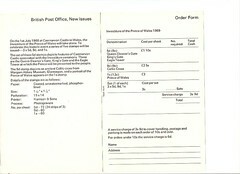 Colour photographs were still very crude compared to todays images and printing colour reproduction almost impossible to align the colours. 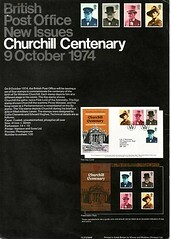 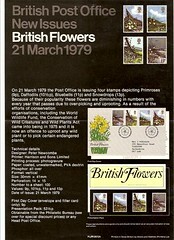 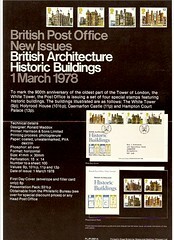 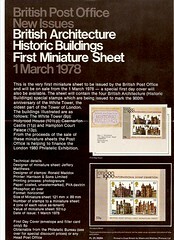 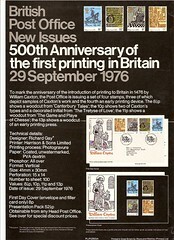 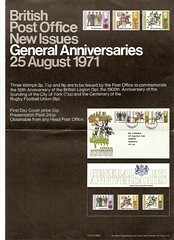 So from the 1940s there were black & white photographs, by 1967 we see the Edinburgh & Agent's pages, and in 1969 the first printed colour reproduction of a stamp as a small folded A4 sheet to give an A5 brochure. 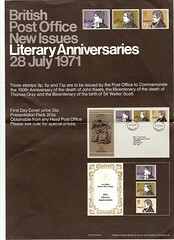 The Edinburgh display pages and US/German agent's items can be found on the "Edinburgh & Agents " page. 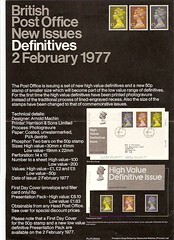 Only the two "posters" , illustrated inside and out have been seen by myself but the PL(P) numbers would indicates there could be an example for all the late £sd special issues. 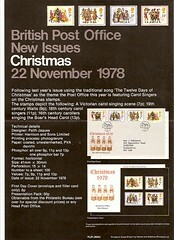 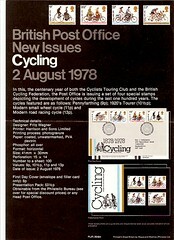 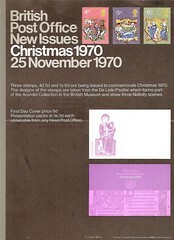 From Xmas 1970-1995 there was a fairly constant style with a black background , illustration and text in white. 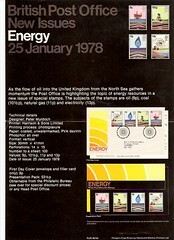 There were only a handful of posters that do not follow this style over 25 years. 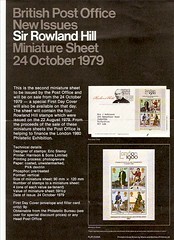 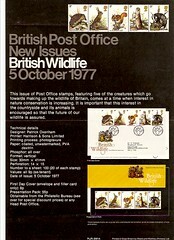 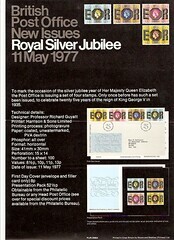 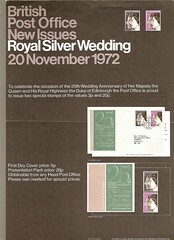 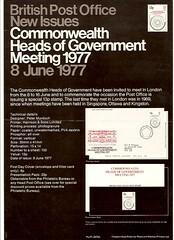 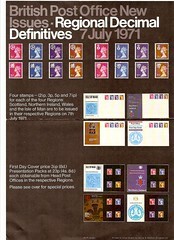 There are different versions on the reverse, listed below . 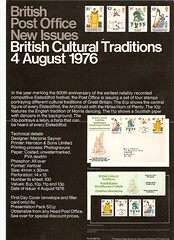 Not every poster exists in each version. 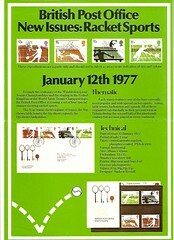 The front of the poster is the same with the exception of the reference number, it is the reverse side details that differentiate the different versions. 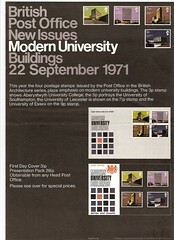 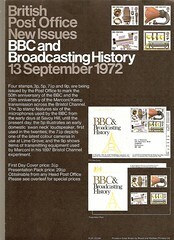 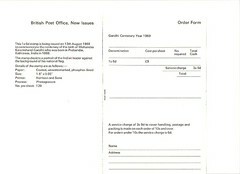 The items ceased to be printed after 1998 when the Internet proved a more popular and cheaper method of disseminating information about forthcoming issues. 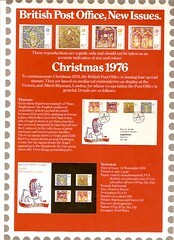 1970 Xmas - 1971 Xmas Its amazing that after nearly 40 years that these posters should appear on the market. 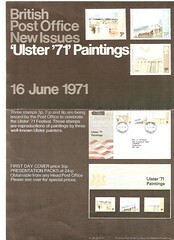 I remember seeing the Regional & Ulster Paintings in a "job-lot" over 15 years ago but didn't buy them at the time. 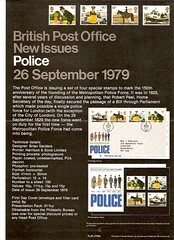 If you hover the cursor over the image you will see the PL(P) number.